Three euros buys you 25+ artichokes at the moment here in Sicily. That's $3.60. From what my friend Susan tells me, that's close to the price of ONE artichoke in Atlanta! 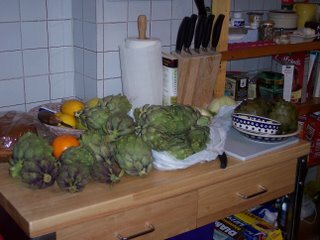 Anyway, she and I wanted just a couple artichokes and ended up with two giant bags of them when we stopped at a roadside vendor in Lentini. I had never cooked one in my life, but recently I had them grilled at a restaurant, so I decided to try that. In the meanwhile, Susan boiled two of them for at least an hour and we ate them with a delicious dip. To make the grilled artichokes, I cut them in quarters and coated them with olive oil and seasoned salt. I put them on a hot charcoal grill for just five minutes per side, and voila! They were great! The next night, I cooked another half dozen or so and used them for supper and for Monday's salad. I still had at least fifteen left, so I took them to work and gave them to Kendra and Pat. Jeesh. It's akin to the zucchini problem in Illinois. Supposedly, Sicily produces fifty percent of the world's artichokes. One town alone produces eleven percent! In Italian, they are called carciofi, and you'll find them on pizza, in pasta, and served as appetizers or side dishes. And they are deliziosi! Winter Olympics a Bit Too Wintry!